After leaving Ballarat we travelled to Bendigo. We planned to stay one night and then travel to Koondrook on the Murray, near the Gunbower National Park, for a cruise on the Murray River and a further activation of that Park. However, those plans did not eventuate and we stayed a second night in Bendigo. The additional night enabled us to catch up with another University friend from the 1960s. The three of us were all in a residential college at the University of Melbourne and our friendships have survived over 50 years. I attended the wedding in Mildura of the couple from Ballarat while I was in College. The fourth member and his wife live in Tasmania. On the way to Bendigo we stopped at Daylesford for coffee. While seated at an outdoor table I noticed the man on the adjoining table. He had a back pack with him and was engaged in conversation with two other men. Then the two left and he was on his own. Suddenly a voice emerged from the backpack and I could see he had radio antennas protruding from it. I engaged him in conversation and he told me he was an amateur radio operator and was also a volunteer with the local CFA brigade. His name is Stewart and his call is VK3FSTU. We conversed for quite a while until we had to leave. I said I would monitor the two metre Mount Alexander repeater and after we were well on our way up the Calder Highway heading to Bendigo he gave me call. This is just one of many such experiences I have enjoyed over the years meeting fellow amateurs on the road. On the way to Bendigo I was feeling a little unwell. I noticed that my heart rate was varying. The condition is called Atrial Fibrillation and was diagnosed late last year. I have been prescribed medication and have been taking this regularly and more recently the condition has become better controlled so I was a little surprised. I did plan to activate the Park during the afternoon of my arrival but decided against that idea. I posted an update to my alert indicating I was having TCXO (temperature controlled crystal oscillator) trouble! A little rest during the afternoon and all was well again so a mere 12 or so hours later I was off to the Park. S 36 38.828 and E 44 18.329. Take the Midland Highway for about seven kilometres past the fountain, to Lean’s Road (a left hand turn as you leave Bendigo) them drive Lean’s Road to Wallenjoe Road and take (a right hand turn) to Wards Road. At this intersection Hart Road (a track) turns off at 45 degrees. My activating spot is about 500 metres along the track into the Park and is suitable for a normal tw0 wheel drive vehicle. For this activation I used my Yaesu FT857D set for ten watts with a linked dipole capable of operating on 80 metres. 3.594 21:58 VK5KAA, Gordon in the Adelaide Hills, a neighbour, s55 r53. The half hour time difference between Victorian and South Australia meant I could join my regular morning net. What a great start to the activation speaking with four of my mates on 80 metres and the first time I have used an 80 metre dipole in the field for 15 years. I then moved to 40 metres and found 7.110 free. 22:26 VK5PAS 59 57 (it was great to hear Paul on 40 metres, but I was planning to go back to 80m later to catch some of the ‘closer’ in amateurs who might miss out if I stayed on 40m. I quite enjoyed my visit to the Greater Bendigo National Park, made all the more fun by those who gave me a call. Contacts are always appreciated. 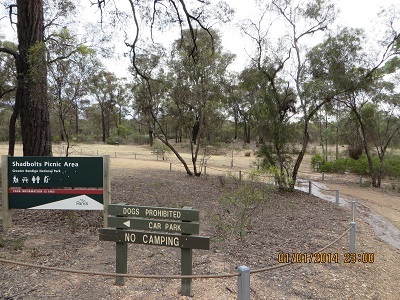 I first visited the Greater Bendigo National Park, VKFF-623, on 2nd January 2014. On that occasion I visited Shadbolt which is in the North-Westerly corner of the Park. I made 13 contacts. Here is the link to my first activation of this Park. After promising an activation of this park I decided to visit the One Tree Hill Lookout on Sunday evening 2st December. I enjoyed six great contacts all on 40 metres. And on Monday morning, before UTC rollover I went back to the park for a third visit, this time taking a track into the Park from the corner of Wards and Wallanjoe Roads. I worked hard for nine contacts! I guess most amateurs are back to work for a few days? I also tried 20 metres un-successfully although I did try to make contact with W1AW/KH6, which was loud. I couldn’t quite make it. I am sure he knew I was there! I now have 28 contacts from this Park, not the 44 I was hoping for more. Oh well! I will come back, I hope! As usual we had with us our copy of the Parks Victoria Visitor Guide. This is an excellent four A4 page document with a map on the middle double page. On the front page there is a section entitled Enjoying the Park: this is then followed by five headings (in bold); Picnicking, Camping, Walking, riding and driving, Dog-walking (in One Tree Hill Section of the Park) and Horse Riding (in two designated sections). Other recreational activities are then summarised in the last paragraph: nature study, photography, orienteering and prospecting. I wonder when we might see amateur radio added to the last section? 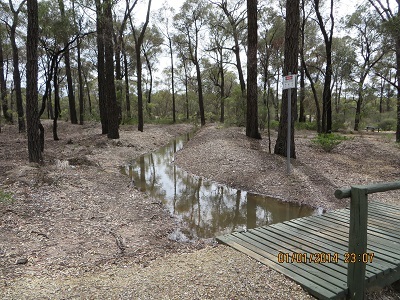 Greater Bendigo National Park is comprised of a number of sections: two large ones, north and south of the city, with the southern portion divided into two smaller sections. I chose to activate a section of the park just north of Eaglehawk. Shadbolt Picnic Ground is an interesting place with a water channel winding its way through the park with plenty of spots for a picnic. I chose one of the park picnic tables to affix my squid pole and soon got down to business with my first contact at 22:34, VK3MRG, Marshall; VK3YSP, Joe on Mount Donna Buang, VK3 VC 002 in the Yarra Ranges National Park and VK3FOWL, Julie from the same spot. Then followed VK5LY, Larry; VK5KGP, Graham; VK5EE, Tom; VK3NCC/m, Colin; VK5BZ, Bob; VK5KC, David; VK3FQ, Ray; VK5LDM, Dennis; VK5NRG, Roy; and VK3ANP, David, a total of 13 contacts.